How the student approaches martial arts training, and with what mind-set, is as important as any complicated series of throws. Most martial arts encourage and develop a certain mental state of mind. To be fully successful in any and all types of martial arts, and to gain the most from martial arts, the student’s mental outlook and approach needs to be developed as well as practical skills. Firstly, any martial arts training is hard, and tough. Some moves or counter moves in most martial arts, especially at advanced levels, are very complicated, and rely on precise timing and coordinated movements. To fully grasp those, a lot of time, practice and patience is needed. At first, the novice will not succeed in getting to grips with everything all at once; that is to be expected. Martial arts training can be physically and mentally demanding and challenging; it is not easy. However, with time and practice comes success. Remember why you are there, and what you are trying to achieve- and that the training is hard, and will take time and patience to master. After all, it took Bruce lee, Jackie Chan and Steven Seagal many years of dedicated practice and training to get to the advanced levels in their respective disciplines. Martial arts training, attaining new grades or belts, is a gradual process, and a reward for hard training and a lot of practice- and is above all a long term path of physical and mental conditioning and self- development. Appreciating that martial arts training is not easy, and is not meant to be easy (after all, if it was, where would he challenge and sense of achievement be?) means that the student sees martial arts training as a long term journey, and a challenge. With such an attitude, the student will appreciate the martial art more, and will learn and gain a lot from training. On a related point, an extension of that is willingness. The student must be willing, at all levels, of any martial arts training. Willing to learn- willingness to develop their skills, and to try new moves, techniques, and to attempt to put them into practice. For the novice, a willingness to step outside their comfort zone, and to try something totally new, and very challenging. Overall, a willingness to push yourself further, physically and mentally. Part of this willingness involves having the eagerness and spirit to put in the effort and energy to learn, attempt and master new throws and moves. With such a willingness to learn, to adapt, and to develop, the keen martial art student will advance up the various grades, and will benefit greatly from their advanced knowledge- simply because they had the desire to learn, and to push and challenge themselves. Another vital point concerning attitude in martial arts training is calmness. 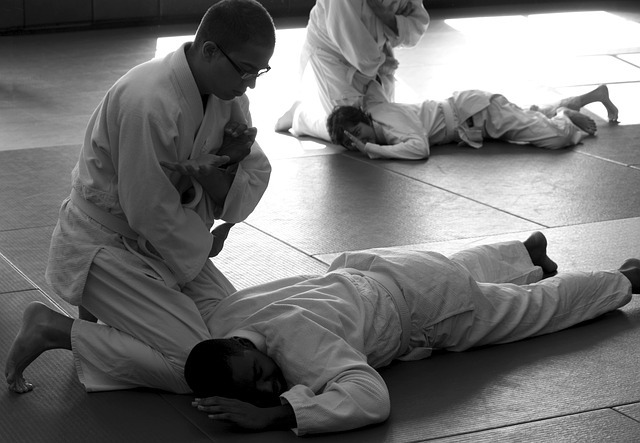 Whilst studying martial arts, the student needs to be calm and relaxed, both mentally and physically. Physical tension and stiffness, stress or nerves is actually quite dangerous in the martial arts arena; the various techniques and throws will not work against a resisting body, and some throws or strikes can actually cause great personal injury if performed against a tense body, or if performed incorrectly due to nerves or tension. A relaxed body and mind will also be more receptive, and more open, in receiving new information about new moves and counter moves that are taught to you. A relaxed approach will enable the student to apply the techniques they have just leaned calmly and with precision as they go through the various holds and twists one after the other in a flowing movement, remembering and applying the various steps of the technique, in coordination with a (ideally, similarly relaxed!) partner. Such a calm state of mind will give the student a great sense of self-discipline and self-control; such mental control will be vital for more advanced levels of martial arts (i.e. when tackling several opponents at once, or when using weapons). With such calmness and relaxation, the martial arts student can face tough, demanding martial arts training with great positivity- and success. Such and attitude and state of mind will give the student great success in martial arts training. With success comes a sense of achievement- and enjoyment. The correct attitude will give the student great satisfaction in their chosen martial art- and will get them to enjoy, and have fun, learning martial arts.